The Addams Family is an animated sitcom adaptation of the Charles Addams cartoons produced by Hanna-Barbera Productions in 1973. Jackie Coogan and Ted Cassidy who played Uncle Fester and Lurch respectively from the 1960s television series returned in voice-over roles. The Addams Family consists of husband and wife, Gomez and Morticia Addams, their children, Wednesday and Pugsley, as well as Grandmama, Uncle Fester, and their butler, Lurch. The Addamses are a close-knit extended family with decidedly macabre interests and supernatural abilities. No explanation for their powers is explicitly given in the series. This series depicts the Addamses on a cross-country road trip, exploring the United States in their Victorian-style camper. Along the way, they stop off at various locations and venues. They inadvertently cause mayhem wherever they go due to their unusual interests and mannerisms, their willingness to trust those who probably shouldn't be trusted, and their getting swept up in criminal schemes or problems without their knowledge. The Addams Family's first animated appearance was on the third episode of Hanna-Barbera's The New Scooby-Doo Movies, "Scooby-Doo Meets the Addams Family" (a.k.a. "Wednesday is Missing"), which first aired on CBS Saturday morning on September 23, 1972. John Astin, Carolyn Jones, Jackie Coogan, and Ted Cassidy provided the voices for their respective Addams Family characters while voice actors were used to voice Grandmama, Wednesday, Pugsley, and Cousin Itt. The episode details the Addams Family in a mystery with the Scooby-Doo gang. The Addams Family characters were drawn to the specifications of the original Charles Addams comics. The first animated series ran on Saturday mornings from 1973–1975 on NBC. In a departure from the original series, this series took the Addams' on the road in a Victorian-style RV. 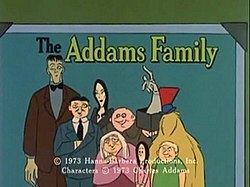 This series followed the relationships of the original Addams cartoons in that Fester is Gomez's brother, and Grandmama is Morticia's mother. Many cast members from the original series and the Scooby-Doo episode reprise their roles in the series, with the exceptions of Astin and Jones whose characters were voiced by Lennie Weinrib and Janet Waldo. The show also introduces the Addams Family's animal companions Ali the alligator, Ocho the octopus and Mr. V the vulture. The theme music was mostly different, except for the four-noted tune from the live-action series. The Addams Family are offered a bargain: New York City's Central Park. To help them clean it up, they free animals from the zoo, but the police come and the Addamses are about to be arrested when Gomez produces unexpected proof that he is in fact the rightful owner of Central Park. The park was bequeathed to an ancestor, Van Dyke Addams, and a deed confirms that it is to be passed on to his heirs. But the cops still have a hard time with Gomez's story. The Addams Family go to Nashville in search of dinosaur bones, but find themselves caught up in a pop festival instead. Lurch is anxious about meeting his pen pal. He becomes a lead guitarist and vocalist for the group Freddie and the Frogs. The rare Boola-Boola is said can be found in the Black Lake and the Addams Family have an exciting time when they join in on the search. But they have more to look for than the Boola-Boola when Ocho the octopus is kidnapped. Petroleum shortage promises to be a thing of the past via Uncle Fester's new invention — "Festerine" — but the Addamses are caught up outwitting Count Evil and the Race Ace. When they succeed at this task, they win a million dollars for their favorite course: Vulture Culture at The Ghoul School of Dracula University. The Addams family enjoy all the fun and gaiety of Mardi Gras in New Orleans, but it is difficult to recognize them in their funny masks. Tensions mount when a couple of crooks masquerade as Fester and Gomez. Thing finds himself in trouble when Morticia is baking Eerie Egg Bread and he falls into the mixture. The loaf of bread wins a national bake-off competition in Chicago before the Addamses figure out what is going on. Then, they embark on a desperate search for the loaf of bread containing Thing. The Addams Family experience an exciting Hawaiian adventure in which they are mistaken for a Stone Age tribe: the lost Hoolamagoola. Also, Ocho the octopus discovers an underwater cave. The Addams Family wins a piece of land on the moon. Preparations arise for a visit to inspect their new possession, and their rocket blasts off with a little help from Uncle Fester. Then comes the problem of trying to find a place to land. A balloon race is attracting a lot of attention, but Professor Orville Byrd's balloon is sabotaged during its entire route from New York City to Los Angeles by the Nasty Brothers. The Addams Family decide to lend a helping hand to the imperiled professor. Spooks are scaring everyone away from the Old Prospector's land and they try to scare off the Addams Family as well when they arrive, to no avail. The Addams family enjoy themselves by outspooking the spooks. The Addamses visit a circus which they discover is "The Worst Show On Earth". They decide to help when Honest John tells them of its troubles with a rival circus stealing its workers. The Addams Family take their first ocean voyage, but the sight of Ali the alligator and Ocho the octopus dancing has every passenger aboard spooked; so much so that they jump overboard. The crooked Lefty and Joe promptly steal all the valuables aboard as a result, but the Addamses are soon in hot pursuit of the thieves as they attempt a getaway in a speedboat. Madame Hoodoo finds all her curses and spells fail miserably to frighten the Addams Family and things digress from bad to worse for her when her love potion backfires and Granny puts a blessing on her. She decides to go back to Haiti for advanced voodoo lessons. Wednesday Addams chooses to visit the Roller Derby for her birthday celebration, and the Addams Family are soon involved between the bitter rivalry of the Angels and the Demons, resulting in the Addams Family playing for the Angels and a gruesome battle of Demons versus Addams Family. Following the trail of the great pioneers, the Addams Family go to the wide open spaces of the West and find themselves outsmarting such characters as Wyatt Burp, Silly The Kid and Badmouth Ben. Pugsley wants a horse for his birthday celebration, so the Addams Family go to Kentucky to buy one. They choose a worn-out old nag named Bones, but Granny's cooking does her so much good that she becomes a fast runner again and is ridden by Pugsley to victory at the Kentucky Derby. Concurrently with their series, the animated Addams characters appeared in public service announcements for the Boy Scouts of America (featuring Pugsley as a Scout), the four nutritious food groups then promoted by the USDA, and forest fire prevention for the United States Forest Service. On October 19, 2010, Warner Archive released The Addams Family: The Complete Series on DVD in region 1 as part of their Hanna-Barbera Classics Collection. This is a Manufacture-on-Demand (MOD) release, available exclusively through Warner's online store and Amazon.com. The series is also available for purchase at the iTunes Store. Gold Key Comics published a 3-issue The Addams Family comic book series between October 1974 and April 1975, boasting stories adapted from episodes of the animated series. ^ "The Addams Family – Warner Formally Announces the Complete Series DVDs for the 1973 Animated Show". Archived from the original on 2010-10-17. The Addams Family (1973) at Don Markstein's Toonopedia. Archived from the original on March 13, 2012. This page was last edited on 29 March 2019, at 19:18 (UTC).